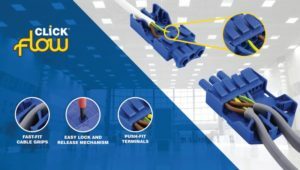 Coming up with products that will help electricians carry out installation projects more quickly and efficiently is what drives Scolmore’s new product development programme, and the latest additions to the Click Flow Connector range are no exception. The new 20A 3 and 4 Pole Fast Fit Flow Connectors feature pushin, low maintenance terminals to offer a time-saving benefit for the installer, with no screws required. In a speed test carried out by Scolmore, the installation times were compared for their new fast fit connectors, versus the equivalent screw terminal version and typically the fast-fit versions were completed in around half the time. Allowing installers to safely connect/disconnect luminaires or appliances in areas that require quick installation and regular maintenance, the new fastfit connectors will be suitable for a range of applications including education and training facilities, offices and conference rooms, healthcare environments and hotels. The new connectors are packaged in outer boxes containing 200 pieces in total, split into four inner boxes each containing 50 pieces – all individually stacked. For further details visit scolmore.com, email sales@scolmore.com or contact Scolmore on 01827 63454.